You’ll love the look we give your yard! SignaturEstates Lawn and Landscape was started by Jonathan Jouben in April of 2006, under the name Jouben Lawn Services. The company has grown from the humble beginning of offering only lawn maintenance services, to becoming Spring City's only lawn and landscape service provider with a full line of solutions for residential and commercial landscapes. Jouben Lawn Services started with the motto "I'll put my name on it" and SignaturEstates Lawn & Landscape carries that same philosophy, "We'll put our names on it!" We want to build long lasting relationships with clients who demand professional service from well-trained, courteous technicians. We care about our customers and want them to know us, so here are some faces to put with the names on your property. Jonathan Jouben, owner of SignaturEstates Lawn & Landscape, is still very much involved with the day-to-day operations of the business. You’ll most likely meet him when you schedule your initial consultation, and if you ever have a complaint or concern that cannot be remedied by other team members, he will make sure your situation is resolved. Jonathan moved to Rhea County to serve at Lakeview Baptist Church as Music Director in August of 2002. After being a private music instructor, assistant band director and then assistant manager at Huddle House in Dayton, he decided to pursue his dream of owning his own lawn care business. He entered into the industry, in this new climate zone, working in the maintenance division of a company in Dayton and when winter layoffs occurred, he got a job with a landscaping company where he was encouraged to go out on his own. Since starting the business, Jonathan completed the Tennessee Master Gardener program (where he still volunteers, teaching landscape design for Rhea and Roane County Master Gardener interns), became state certified, licensed and chartered for landscape pesticide applications and obtained certification from the Interlocking Concrete Paver Institute. He regularly attends seminars and conferences to keep up with new products and services within the industry. When not involved with SignaturEstates Lawn & Landscape, you can regularly find Jonathan either at Lakeview Baptist Church (where he began serving as pastor in March of 2009) or with his wife, Jennifer, and their six children (any of which you’re likely to meet on your property as they learn the aspects of the business and spend time with Jonathan). Jonathan has also served as the director of the local chapter of Reformers Unanimous Addiction Recovery ministry since starting the chapter in February of 2010. He became passionate about proclaiming hope and healing to addicts and their families after a church member's son survived an overdose in July of 2009, just months into his pastorate. Jonathan loves learning, problem solving and ministering to people of all different backgrounds, and cherishes the opportunities being a small business owner affords to meet new people and be used of God to proclaim the love of Jesus Christ. Andrew Harris joined SignaturEstates Lawn & Landscape upon graduation from Rhea County High School in 2015. He’s a life-long resident of Spring City, where he now resides with his wife, Jessica. He’s worked his way up from an entry level technician to maintenance crew manager, obtaining his state pesticide certification in September of 2017. Andy is a member of Webbs Chapel Church of God, and a volunteer with the Rhea County Volunteer Fire Department and Rhea County Rescue Squad, where he is the 2nd Lieutenant. He is studying fire science at Chattanooga State Community College and has a long term goal of becoming EMA director of Rhea County. 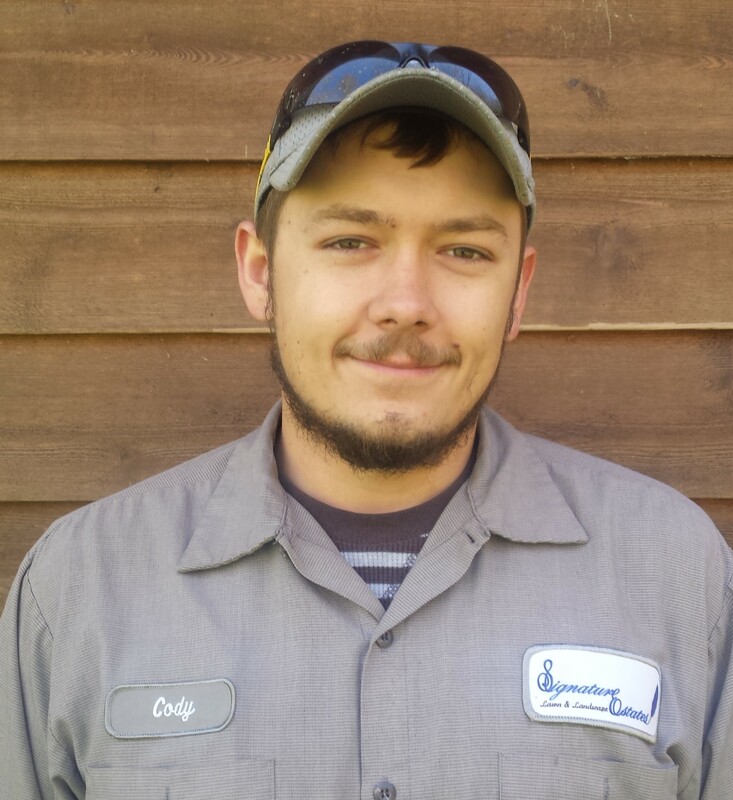 Cody Kidd joined SignaturEstates Lawn & Landscape in May of 2016. He previously worked with a line maintenance contractor for TVA where he became proficient in tree felling. He has served as a landscape maintenance technician and landscape maintenance crew leader before cross-training with the lawn maintenance crew in the fall of 2017, becoming our newest maintenance crew manager. Cody has made Spring City his home since 2001, graduating from Rhea County High School in 2013. He enjoys helping people and spending time with his girlfriend and family, especially his niece and nephew. Cody is looking forward to earning his state pesticide certification this spring and marriage in the not-too-distant future. Andrew Kleiver joined SignaturEstates Lawn and Landscape upon moving to Spring City from northern Virginia in May of 2017. 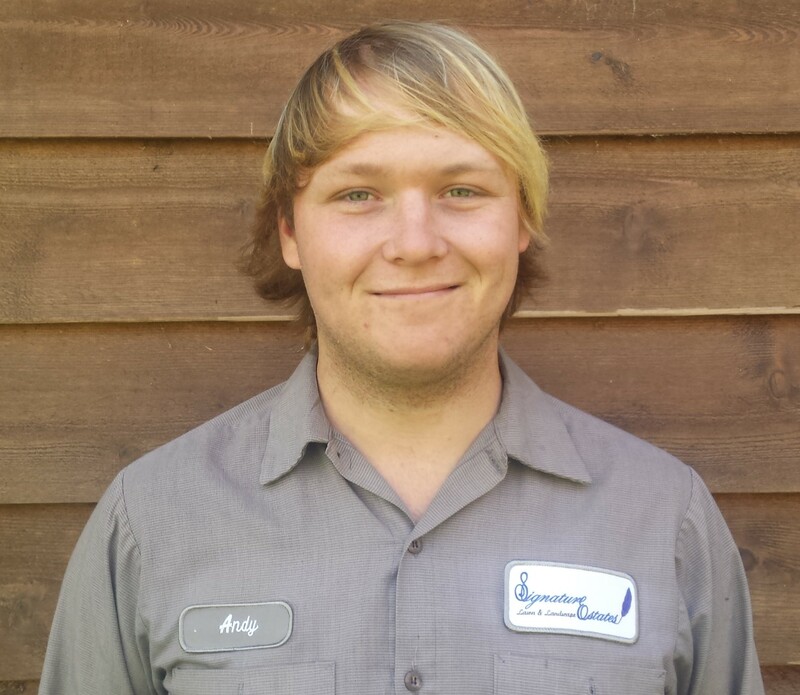 Andrew entered the industry in 2012 working with True Green Landcare and then Ruppert Landscape. 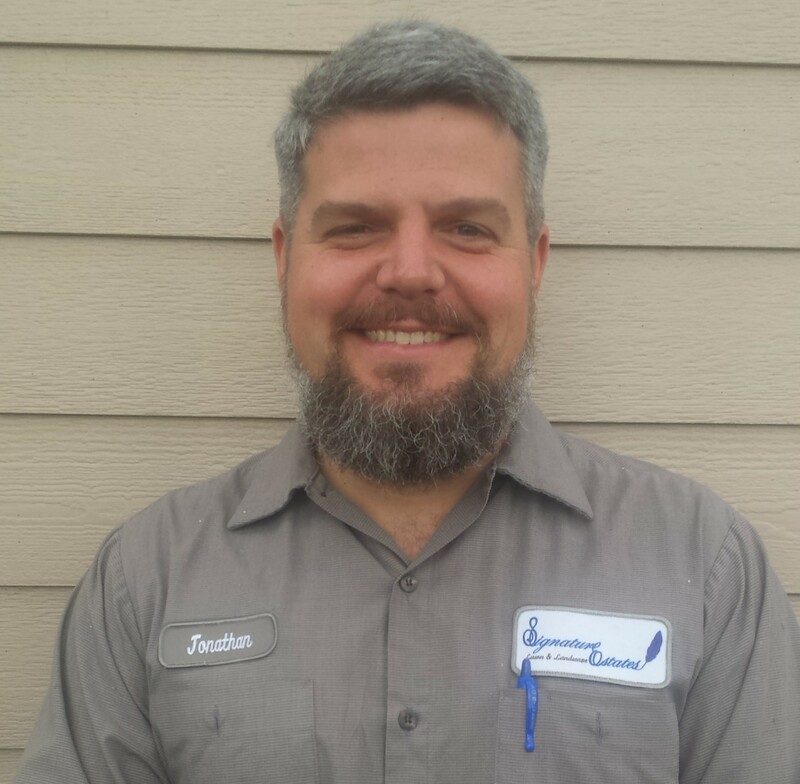 His experience includes serving as a maintenance crew leader, a production manager, and an irrigation technician. 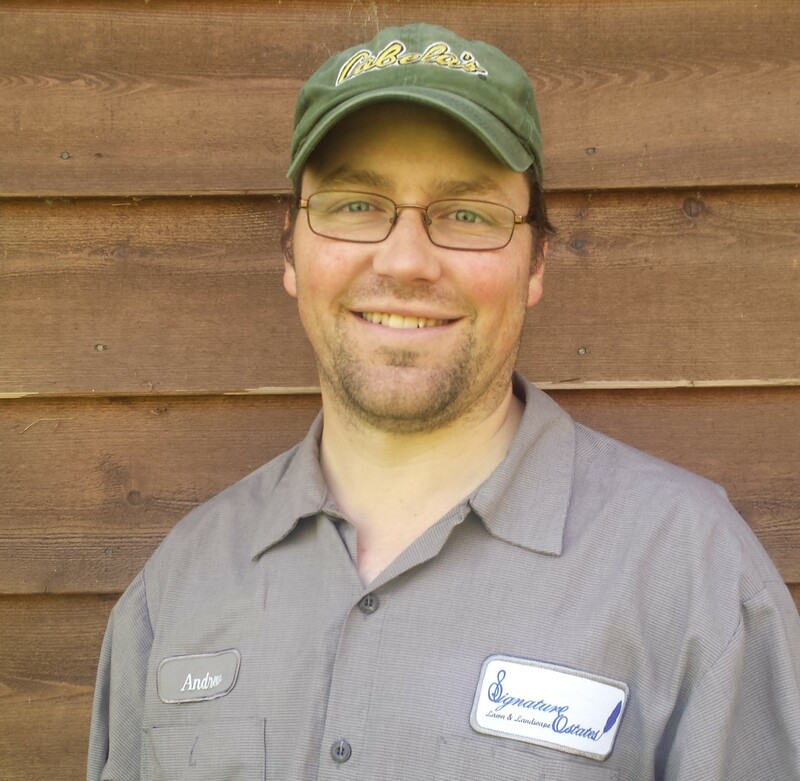 Andrew earned his state pesticide certification in September of 2017 and is now our irrigation and application manager. Andrew and his wife, Faith, are working toward fulfilling their calling as missionaries at Cedine Bible Camp and are members of First Baptist Church of Rockwood. Andrew enjoys spending time with his wife and children and helping with sound and videography at church. You can rest assured that your risk is covered when your property is being serviced by SignaturEstates Lawn & Landscape because a General Liability Insurance through Nationwide Insurance (Ron Travis Agency - (423) 775-3011) and Workers Compensation Insurance through The Hartford are maintained to cover any mishaps. (Certificates of Insurance are available upon request).. All employees are E-verified to ensure legal work status and weekly safety meetings are conducted to keep everyone aware of the responsibility to work in a safe manner. Additionally, SignaturEstates Lawn & Landscape is a drug and alcohol free and tobacco free work place. Any employees that do use tobacco must take a break and walk off property for tobacco use. SignaturEstates Lawn & Landscape maintains a Rhea County business license as well as a State of Tennessee Pesticide License and Charter (#5109). All pesticide applicators are individually certified with the state as well. SignaturEstates Lawn and Landscape has been a member of the Spring City Chamber of Commerce since 2007 and our team has completed volunteer projects landscaping the Spring City Depot and installing pavers and retaining walls around the depot.